TransparentPanel is a great container for your iDesk controls on your form. If you want to group them or underlay with fancy images or basic shapes, the TransparentPanel is the best way to do this. It supports transparency, so your application with translucent glass design will stand out from the crowd. 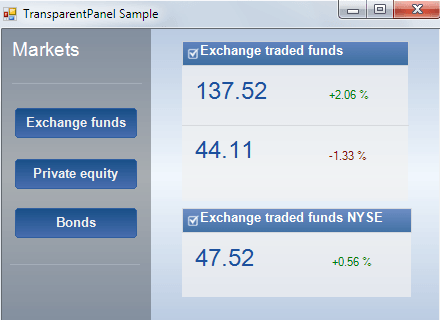 TransparentPanel supports transparency itself. If you place it on other iDesk control, you can set the opacity for the TransparentPanel, so you will experience a translucent effect, and you will see the underlying control trough the TransparentPanel. It also provides this effect for its iPack children controls.